Rema is a Nigerian singer that was unveiled recently by Don Jazzy the CEO of Mavin Records. The Mavin Records is undoubtedly one of the largest record in Nigeria. In this post we shall take a quick look at the biography and some of the songs of one of Mavin Records new signing called Rema. The full biography of the young musician is not yet available,however Rema was born Divine Ikubor 18 years ago. He grew up in Benin City Nigeria. He was born into a Christian family. Rema's venture into music started when he was younger,back then he used to rap in his church and school,while in school he created his own live band. Q: Rema Career & Songs? 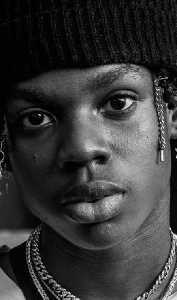 Rema's career hit an all time high when he was discovered by D’Prince. D'Prince is the younger brother of Don Jazzy the CEO of Mavin Records. Rema is currently affiliated to D'Prince's jonzingworld record and Don Jazzy’s Mavin Records. The new signing was confirmed after the Mavin Boss Don Jazzy took to Instagram to announce the signing of Rema to his Mavin Records,he wrote "Today another Mavin is Activated". Don Jazzy went ahead to shower praises on the new Mavin Record act,he described him as the future of Afrobeats. Rema will be joining other Mavin acts like Tiwa Savage,Korede Bello, D'ija, Dr Sid, D'Prince, Poe, Johnny Drille and the DNA twins. The Mavin acts has dropped some singles that are climbing the charts,some of his songs include 'Dumebi' 'Corny','Why','Iron Man'.